Sorry for the delayed response, ma'am. Just was away from my blog for a while. 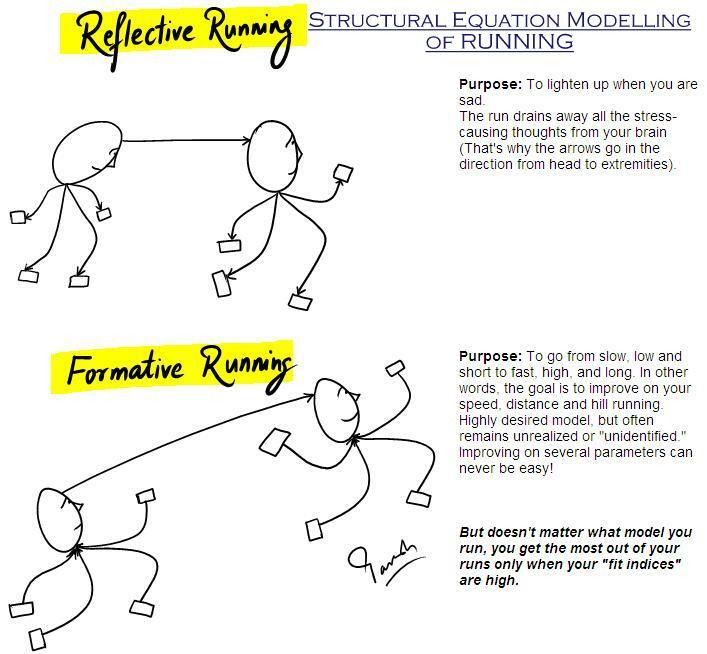 Coming to the sketch, here I was just making an analogous comparison of running with Structural Equation Modeling (SEM)--a statistical modeling procedure that uses path diagrams. There is also some play on words here. 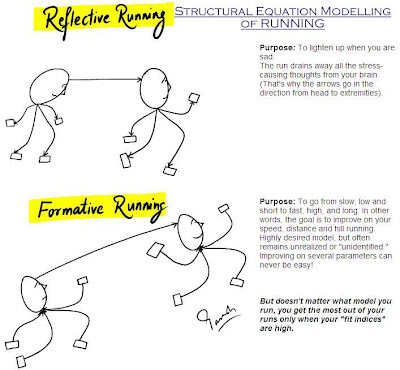 Reflective and formative models are two types of models in SEM. I thought those words correspond well with two main purposes of running. Similarly, statistical models are evaluated based on fit indices, and fitness indubitably applies to running. what does 'fit indices' mean? Hi Ram, fit indices in SEM are number that show how well a model fits the data. A model may be elegant, but if the fit indices are not high enough, it is pretty useless. I thought the term "fit indices" relate well with running as well. In this context, fit indices would be the numbers corresponding to heart rate, oxygen carrying capacity, BMR, etc. Of course, most of us don't bother about these figures, but running is most efficient and enjoyable when our fit indices are good.